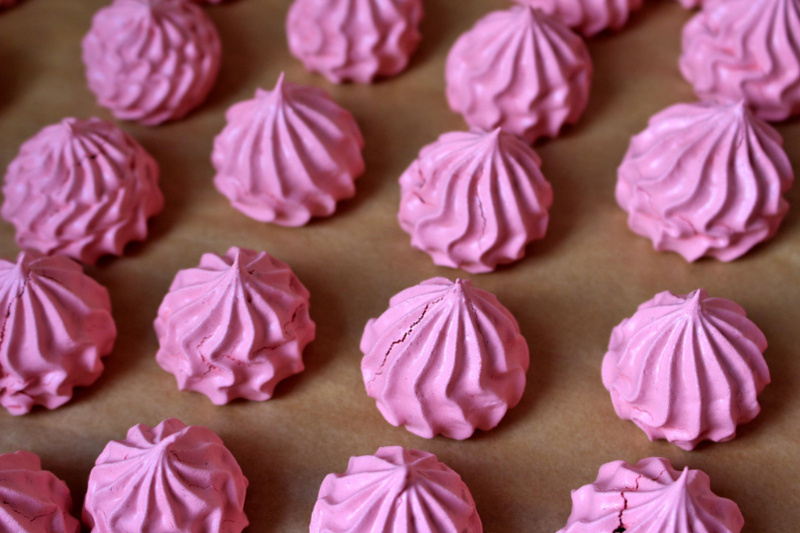 I love meringue, that’s why I have lots of recipes with meringue on my blog, even though my blog is not that old yet. Just to name a few: French macaron, meringue nests, rhubarb pie with meringue topping, and meringue on top of berries. 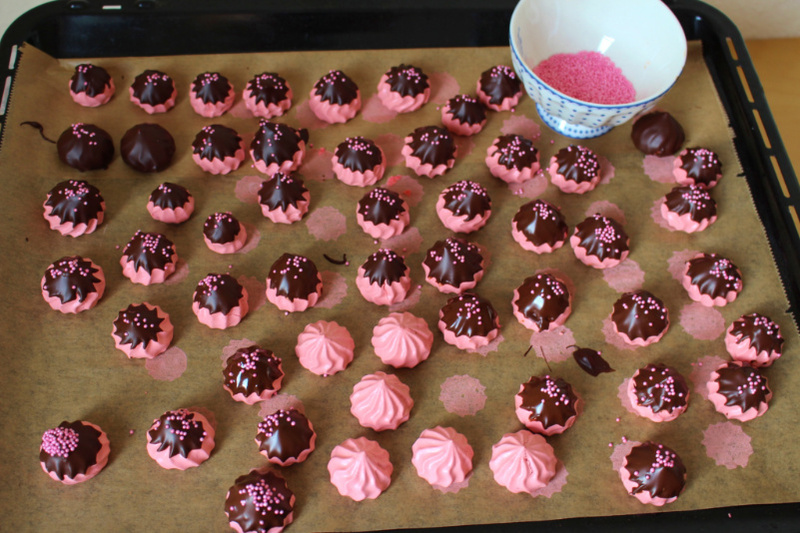 For that reason I was very excited when I learned that Lisha from the blog MainBacken (in German) was going to share a meringue recipe for my blog event. In case you don’t know, I am currently hosting a blog event in which I ask you to make something from scratch and to share it with a coffee invite. For further details check here. The event will be over on March 15, 2018, so you still have time. Congratulations to your first blog anniversary, my dear Jenny. People or babies usually are not aware of their first birthday, so it doesn’t really matter if something goes wrong. But for your blog it is very different! After one year the wheat separates from the chaff and many ambitious hobby bakers give up. But what Jenny has created here on jennyisbaking in the short amount of time is amazing. I love her clear signature, which can be found in all blog posts and the warmth that breathes in the pictures. It is a nice contrast to my blog style (I am also passionate about my blog), but I am probably rougher. 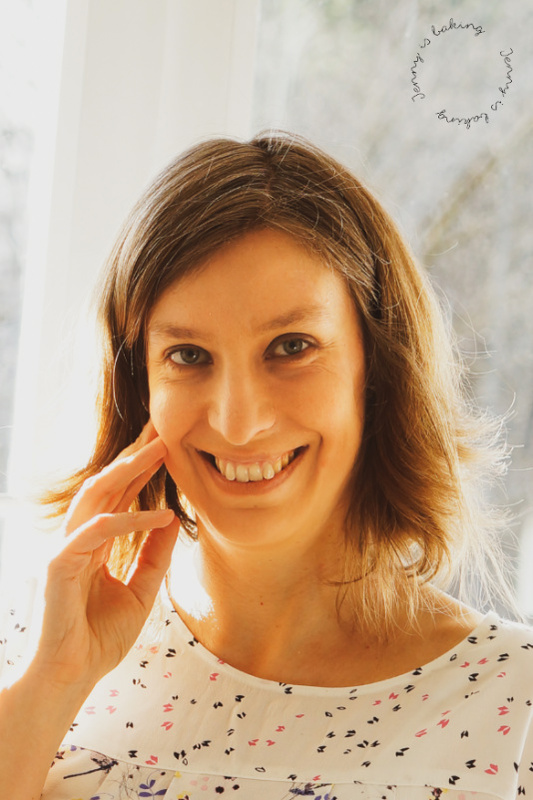 My name is Lisha and I have been blogging on MainBacken.com for three years (my blog anniversary is shortly after Jenny’s blog event). I love to blog about sweets things. Hopefully nothing too fancy, with a creative twist, and the rough kind of charm from Frankfurt. 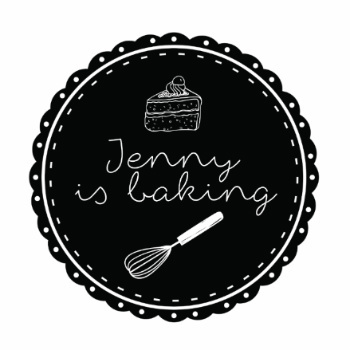 I learned about Jenny’s blog because she often comments on my blog MainBacken. It was nice to find out that she is not only making nice comments, but actually is a nice person! That’s why I was happy to contribute to the coffee invite event and wish all the best and lots of love for your blog anniversary! But now let’s move on to the important question, what did I actually decide to share? I thought I would go with something simple, easy, and delicious. 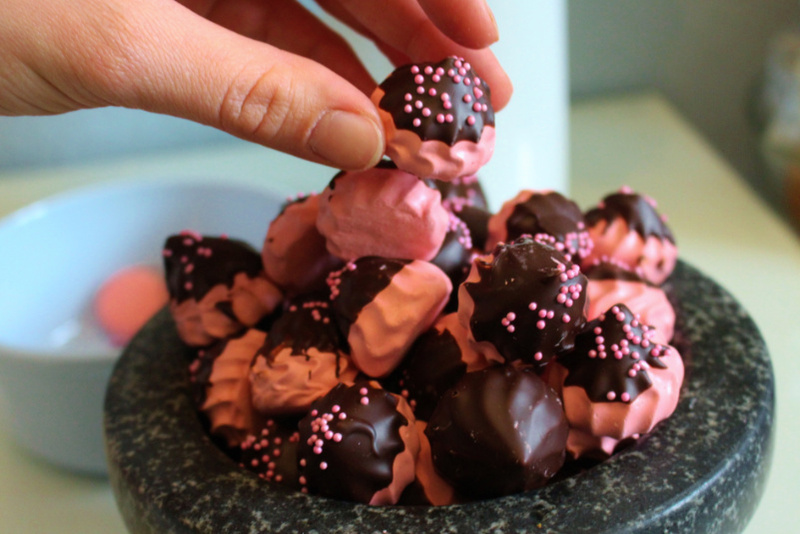 Meringue with a dollop of color and dunked into chocolate. They are perfect for coffee and can be easily prepared a few days in advance if kept in an airtight container. So let’s have a look at the recipe, I promise, it is really simple! Preheat oven to 100 degrees Celsius. Seperate egg whites and measure the sugar. Beat egg whites on medium for a few minutes, add salt after one minute. Beat on high for an additional five minutes while slowly adding the sugar. You should get stiff peaks. Add the vanilla extract and food coloring last and only stir until combined. Pipe small circles on parchment paper or use two teaspoons to make nests. Bake at 100 degrees for about 40 minutes. Should get off parchment paper easily, otherwise leave in oven longer. 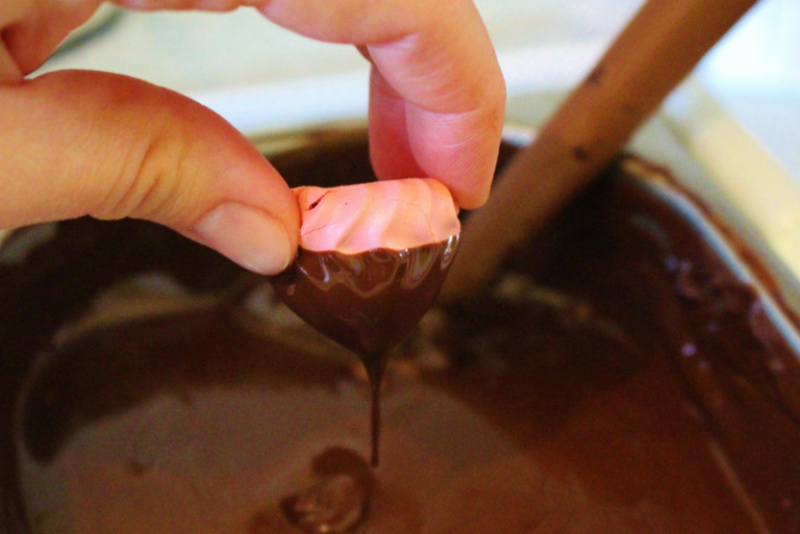 Melt chocolate and dunk meringue kisses in it and sprinkle if desired. No idea what to do with the leftover egg yolks? Check out see this blog post including how to freeze them properly. PS: These kisses are so cute, maybe you would like to even make this recipe with your coffee invite? Or what have you planned for yours? Yes, I agree! I will have to make them soon!